Experience island hopping on a private yacht. The Crystal Esprit delivers a one-of-a-kind luxury cruise experience. 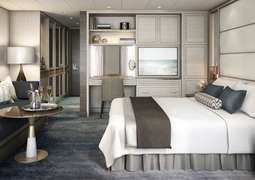 Crystal Cruises’ first “cruise yacht,” the Esprit is a one-of-a-kind ship providing a unique luxury experience at sea. The smallest of Crystal’s ocean vessels, the Esprit excels in short, shore-heavy voyages with an unparalleled level of service. It features all the necessary amenities of a luxury ship, but with a more personalized, intimate experience. The high staff-to-guest ratio ensures a level of attention passengers have come to expect from Crystal cruises, and the ship’s small size makes it possible for it to visit smaller, lesser-known ports. This gives passengers the chance for a unique travel experience as well as the opportunity to escape the crowds. The Crystal Esprit is the perfect ship for island hopping exotic destinations in unmatched luxury and style. The staterooms on the Crystal Esprit are spacious, well-designed, and outfitted with all of the amenities one could expect on a luxury cruise line. Every room has an ocean view and every room is a suite, with most staterooms measuring at a spacious 280 square feet. A flat screen TV, an iPad, and 60 minutes of free WiFi per day are just some of the amenities guests can expect. The highest class of stateroom, the Owner’s Suite, encompasses 515 square feet and contains a king-size bed, a separate living and dining area, and a luxurious Jacuzzi bath with a separate rain shower. None of the suites have balconies. Despite the ship’s small size, the Crystal Esprit offers a variety of dining options at each of its three on-board restaurants. Locally sourced and skillfully prepared, food is always one of the fine points of any Celebrity cruise. The Patio is great for passengers who like to be spoiled for choice: Indoor or outdoor, hot or cold, hearty or healthy, the ever-changing menu provides a variety of breakfast and lunch options for passengers of all tastes. The Yacht Club Restaurant offers gourmet four- and five-course dinners which are highly customizable. In addition to the options changing every day, passengers can mix and match from different menus to create the perfect meal to suite their fancy. The Sunset Grill is perfect for those who prefer to keep it casual, offering an upscale twist to traditional grill fare. Gourmet salmon burgers and sweet potato fries are offered here, as are classic beef burgers and delicious steak. With its exotic destinations and strong emphasis on shore excursions, the Crystal Esprit is the perfect ship for the adventurous traveler. While it still provides cruise ship classics such as an onboard pool, a spa and a piano bar, the real fun lies starts on the water. The ship is outfitted with a marina, and, weather permitting, passengers can snorkel, swim, and jet ski directly from the ship. The highlight of the Esprit is a submarine, which passengers can book for a unique underwater tour. The submarine holds three passengers and one cruise member, and can dive to a depth of 1,000 feet. Passengers can get up close and personal with the sea life and see the ocean like never before, all from the safety and comfort of this glass-domed craft. Passengers tend to dress more casually onboard the Crystal Esprit as compared to other Crystal ships. Because of the high number of port calls and daytime activities, passengers tend to don activewear during the day, basing their wardrobe on the local weather. For dinner at the Yacht Club Restaurant, passengers tend to go smart casual or resort elegant, so you can leave the evening wear at home.